I chose to study at City, University of London because the University is located within central London and also, during Open Days I was able to see what the University has to offer for students, such as their IT facilities and library areas. I also saw how they provide help for new students so that they feel welcomed and comfortable whilst getting to know the University a little better. Why did you choose to study this particular course? 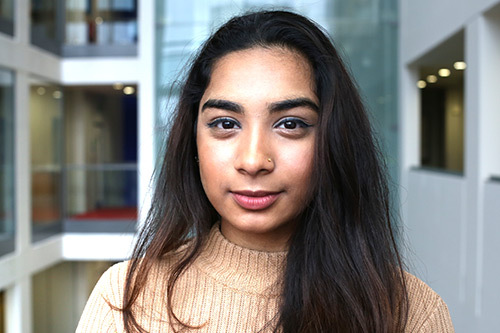 I chose to study BSc Health and Social Care because I want to work within the health and social care sector; such as working with vulnerable individuals from all different age ranges and settings. The course has modules which can aid my understanding of individuals who are both clients and service users of different types of settings, for example in pre-schools and residential care homes. My favourite module so far has been Contemporary Issues in Mental Health because before I started this course, I always used to refer back to mental health as something which was negative and I did not think how it could also be something positive. By participating in this module, I have learned about the different types of mental health, why people may be affected by mental health issues and how it may have an effect on others. The highlight on my course would be learning different and new things that I had no prior knowledge on before starting my course at university. With every lecture and seminar, new things are being taught and discussed in the classroom. The teaching on my course has been very good- all lecturers are very helpful when explaining certain points during a lecture. Also the seminars allow us as students to get interactive with the teachers as well. This has helped and encouraged me to ‘speak up’ about things which I do not understand. Have you participated in any extracurricular activities at City? As a student rep, I am looking forward to giving feedback to my teachers that has been discussed between myself and my classmates. Feedback could include how to make teaching more fun and what would get the class to become more interactive during sessions. As the students know what they want to achieve in this course as well as what to improve on, giving feedback during meetings will help students meet their goals and perform well. The course will also be the most enjoyable. The biggest challenge I have faced whilst studying at City has to be having the right balance when doing assignments and revising for exams. As assignment dates are very close by, you need to have a clear plan on how everything will be done and to make sure that you always do it before the deadline date. What are you most looking forward to during the rest of your time at City University? I am looking forward to enjoying my classes with new University friends, learning more, starting new modules during this year and my third year and graduating with a good grade. After I graduate, I plan to do a PGCE in secondary school teaching. I want to teach Health and Social Care to secondary school students and my course will be able to help with my future career, as I will have a solid understanding of all aspects included in health and social care. This is because the BSc Health and Social Care course teaches a wide range of interesting topics such as mental health, lifespan studies, housing and poverty etc. I will be able to use the quality information and knowledge that I have learnt throughout my course at City, to teach.